The Multi-function GroundHound – Site Safety Warning System is an instrumentation system designed for the protection of linemen on a work site. The system consists of a Sensor Unit and a Handheld Unit communicating via wireless protocol. 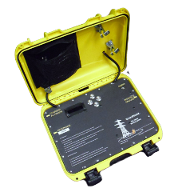 The sensor unit, a self-contained ruggedized case that is safety yellow, is connected to the worksite ground and lies 20 feet away from it. The sensor can be set to monitor and alarm on three levels of hazard, utilizing an emergency flashing light and an audible alarm which is loud enough to alert the crew above the sound of a typical worksite’s running trucks and bobcats. The handheld unit, a smart phone is clipped to the foreman's belt and contains additional alarms. When an alarm is triggered at the sensor the phone vibrates and sends an audible alarm to the foreman. Transmission line workers are in constant danger of Ground Potential Rise, Step and Touch Potential and Transient spikes in voltages. Field tests show that only 1 amp of current (500 ohms or higher) can produce a 500 volt potential. iPhone controlled to prevent putting workers in danger.